It is with broken hearts that we the children of Sophie Batiuk announce her sudden yet peaceful passing on Saturday, November 3, 2018 at Bethesda Hospital in Steinbach, MB. 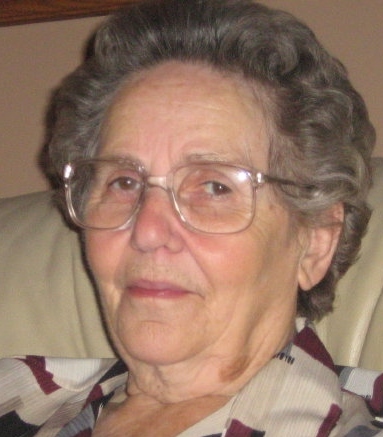 She was born the third child, but first Canadian born child of Ukrainian immigrants Juraj & Marja Chomyszyn on May 5, 1931 in the small district of Veillardville, Sk. Mom spent her first 20 plus years growing, learning, and working, on the family farm in Veillardville. It was of deep importance to her that she share her stories of growing up on the farm. She relished the times when she had a captive audience and would tell and retell what she wanted us to know and remember. In her later years this drive to have us remember increased so that we may share her life story with our children and their children. Mom loved growing up on the farm and especially enjoyed going to school it seems every subject was her favourite subject. Mother was a great student always eager to learn and always helping the younger students in the classroom. When her mother gave birth to the youngest son (mom’s youngest brother George) it was September and she was made to stay home from school for two weeks as her mother and father needed to finish harvesting the crops for the winter ahead – mom was very upset about missing school those two weeks and had never let her younger brother forget it. She often spoke of the one room school house she attended which of course was miles away and she had to walk uphill both ways. She fondly spoke of the cold winter days when the school teacher would make hot chocolate from fresh diary cream over the wood stove in the school for lunch and mom would enjoy her cup along with her sandwich of homemade jam and homemade bread all the while jealous of some of the other student’s store bought jam and store bought bread. Mother often spoke how her father played violin and so many evenings were spent with nearby farm neighbours listening and dancing to the music while the children hid and listened and watched from another room. Stories were told of picking rocks in the field, herding the cattle in the evening, listening to the coyotes howl at night, the fox in the chicken coop, the difficult time her father and mother faced in the new country and especially in the harsh conditions of winter, Although, the work on the farm was difficult and never ending she always spoke of those growing years with such love and fondness. Mother grew into a beautiful, intelligent, and hardworking young woman while on the family farm, but her life was about to change when our father John immigrated to Canada and moved into his cousin’s home not far from the Chomyszyn farmstead. He must have been quite the dapper young man as he swept mom off her feet and they were married only four months after his arrival. On November 14, 1948 mother became Mrs. Sophie Batiuk. Their first child (Roman) arrived over a year later, followed by Irene two years later. Dad was not much interested in farm work and so eventually a move to Dauphin, MB. was decided upon where dad could continue his work with CN rail. This is where their next four children were born: Nancy, Theresa, John, and Joe. While dad was busy working mom was extremely busy being a mother to six children. As the children grew mom worked at various jobs in Dauphin, but the longest and most rewarding was her job at the Dauphin Hospital and Dauphin Personal Care Home. It was while working at the hospital where she met and worked with some extremely wonderful women that were a large part of her pre and post retirement years. She spent over twenty years working in the hospital kitchen and in the kitchen office as a dietary aid. The years went by and mom and dad had a very close knit group of friends. They always seemed to have friends, relatives, co-workers or neighbours dropping by for coffee or a drink and of course to snack on some of mom’s incredible baking. They attended many weddings of their friend’s children where they would dance the night away, what a beautiful couple to watch on the dance floor. There wasn’t many waltzes, or polkas played that didn’t bring mom and dad to the dance floor. Those that knew mother knew how incredibly hardworking she was – if anyone wanted any proof of that they need only look in the backyard of the family house in Dauphin, There in the back stretched across a huge lot and a half was according to mom a small garden, yet the rest of us referred to it as an acreage. After dad’s passing we affectionately teased her about the annual potato harvest – we told her that if she referred to harvest as a potato festival more of us might be tricked into coming home in September. Mother would spend hours and hours in her garden often worrying us when we could not reach her by phone for an entire day. When we finally were able to catch her late at night she would just say, “I was out in the garden”. When mom moved to Steinbach in July of 2012 she managed to keep her love of gardening going – she planted a large balcony garden box container with strawberries which kept her with a summertime supply of fresh berries. She also would plant many containers of flowers to the delight of many living in the apartment complex. Many tenants would stop and compliment her on the beautiful flowers and much to her delight some even took pictures. Mom had many interests: cooking & baking, reading, and travelling were always on the top of her interest list, What a wonderful cook and baker she was – time and time again the family holiday gatherings and special family events were spent devouring her Ukrainian food dishes and enjoying anyone of many homemade dainties and pies. You could never ask her to bake just one or two things, because she always multiplied those one or two things by ten. A perfect example is when she was asked to bake four dainties for a bridal shower and she showed up with fourteen different dainties – amazing. Her secret pie crust recipe is going to be dearly missed. Mother was an avid reader. It was nothing for her to pick up a new book to read in the morning and fall asleep at night with the same book in her hand and very close to completion. She loved reading mystery and suspense books as well as the good ole country westerns. Mother was fortunate enough to be able to do some travelling. She and dad took a trip to the Ukraine in 1976 where she was able to meet dad’s sister and nephews. She also travelled many times to British Columbia and Alberta to visit her brothers, A few trips to the US include traveling to North Carolina with Roman, Audrey and her sister Ann to visit her sister Helen and nieces in North Carolina as well as a trip to Florida with her daughter Nancy and sons John and Joe, A memorable three week trip to the US was also taken with Nancy and Irene which took them all the way to Nevada. Car rides through the countryside were so thoroughly enjoyed by mom. Every spring she would let you know which fields were ready for seeding and which fields were behind. The summer would find you listening to how the crops were coming along and which crop was which. The fall drives had you listening to her explaining to you which crop was ready to be harvested and which were good or poor crops. These long country drives brought a huge smile to her face and a huge smile to ours knowing she was happy. Mother would often say that life is short, in a blink of an eye the years go by so make sure that you take the time to enjoy the time you have. Mom was predeceased by: her husband John of 44 years in July 1992, her parents Juraj & Marja Chomyszyn, sister Ann Anaka and mostly recently her daughter Nancy Batiuk. Mom will live on in the hearts she left behind: her children – Roman (Audrey) Batiuk, Irene Firestone, Theresa (Les) Highfield, John (Paulina) Batiuk, and Joe (Kathy) Batiuk. Mom was also a wonderful and loving baba to her grandchildren: granddaughter; Chelsea (Allen) Little and grandsons; George (Carri) Mayers, Greg (Shannon) Batiuk, Kris Mayers, Bryan (Kaitlyn) O’Rourke, Steven (Laura) O’Rourke, Eric Batiuk, Mark Highfield, Brian (Erika) Highfield. Some of mom’s most special moments came with each announcement of the arrival of a great grandchild. Many special times were spent with her great grandchildren: Taylor Godlein, Connor, Ava & Aiden Batiuk, Korbin Mayers, Brycen Highfield and Lincoln Highfield. Mom was also very excited and was beginning to prepare for the arrival of her next great grandchild due to make an appearance in late April 2019. Mom will be dearly missed by her brothers and sisters: Helen Paschall, Pauline Zagrobelny, Ed Homis, and George Homis. She will also be fondly remembered by many nieces and nephews. A memorial service will take place at Korban Funeral Chapel in Winnipeg on Friday, November 9, 2018 at 4pm. A private burial will take place in Dauphin at the Riverside Cemetery on Saturday, November 10, 2018. Pallbearers for their baba are: George Mayers, Greg Batiuk, Chelsea Little, Bryan O’Rourke, Steven O’Rourke and Eric Batiuk. Sneath-Strilchuk Funeral Services in Dauphin and Korban Funeral Chapel in Winnipeg are in care of the arrangements.